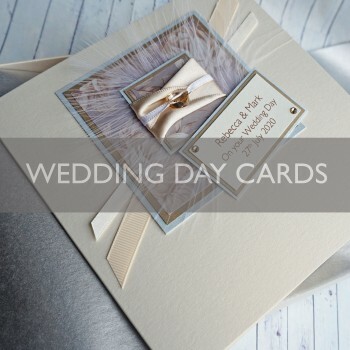 Congratulate a Happy Couple on their Big Day with a beautiful handmade card from our Wedding Collection - beautiful handmade, personalised cards to celebrate the wedding day of a special couple. 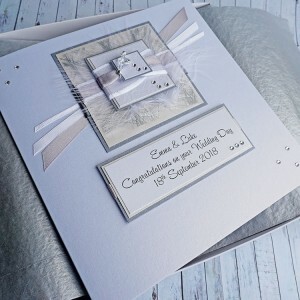 Our selection of elegant and sparkly cards can all be personalised on the front and the insert for free making them special gifts to celebrate the marriage of a Son or Daughter or a Special Couple or Friends. 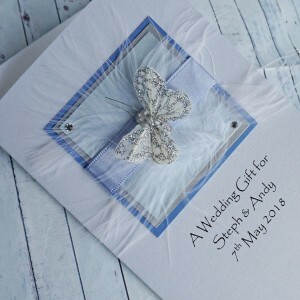 Many of our hand made designs are available with your choice of envelope or presentation box, lined with tissue paper and wrapped with a satin ribbon for that extra special touch of luxury on the Big Day. 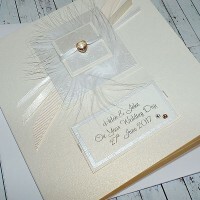 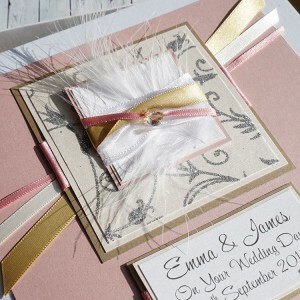 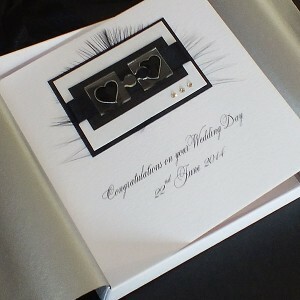 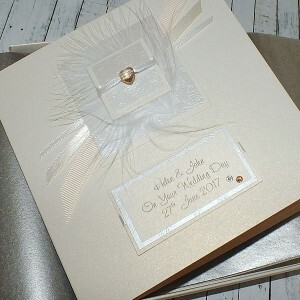 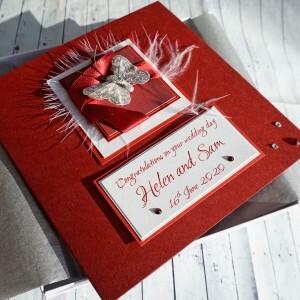 Personalised Boxed Wedding Day Card "Elegance" A lovely card for a wedding, engagement or ann.. 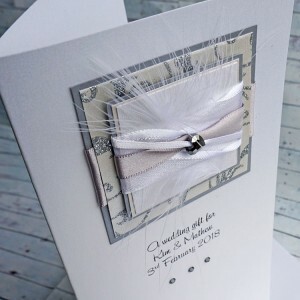 Wedding Day Card "Pink Champagne"
Boxed Wedding Day Card "Pink Champagne" A personalised wedding day card personalised for Daug.. 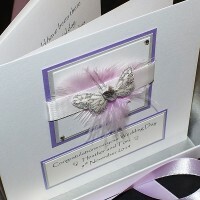 Handmade Wedding Card personalised for Wife or others "Lilac Feathers" A pretty card wi.. 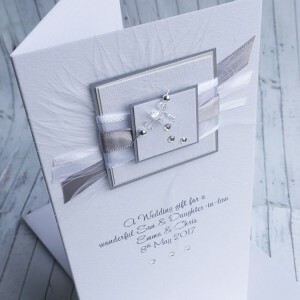 Handmade Boxed Wedding Day Card "Blue & Silver" Personalised for a wedding day, wedding a.. 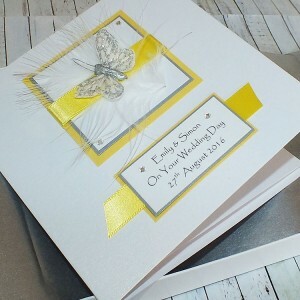 Handmade Boxed Wedding Day Card "Yellow & Silver" Personalised for a wedding day, wedding.. 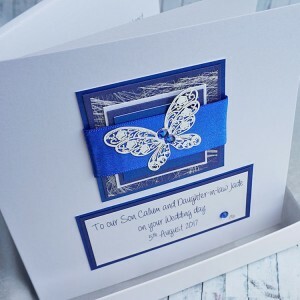 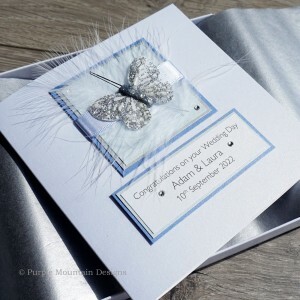 Handmade Boxed Wedding Card "Blue Butterfly" A blue and silver sparkly feather butterfly moun..
Large Personalised Handmade Wedding Card "Lilac Feathers" Perfect for husband, wife, daughter.. 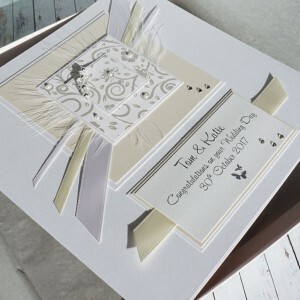 Handmade Wedding Day Card for Son, Daughter, grandson, grandaughter, friends A beautifully el.. 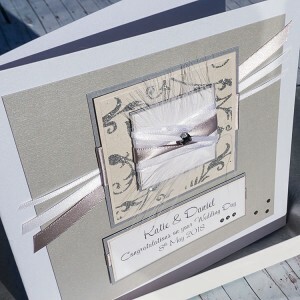 Luxury Boxed Wedding Card for Son, Daughter, Grandson, Granddaughter "Red Ribbons" A pretty c..